We will begin handing out flyers and raising awareness about the prisoners before and after - please get involved and join us! On 16/12/2014 the Mossos, Catalan police stormed 14 homes and community centers, destroying and stealing everything they could find of value. Without making any specific accusations and acting in complete secrecy, 11 anarchists were transferred to the National Court in Madrid. 4 were released two days later - and 7 have ended up in prison, one is a member of the CNT-AIT Union. They are all facing secretive Court proceedings. ‘Operación Pandora’ is a deliberate attempt to intimidate and criminalise the libertarian movement, which has been pursued by the Spanish Audiencia Nacional [a special unit of the judiciary to combat "terrorism"] and the Catalonian police. 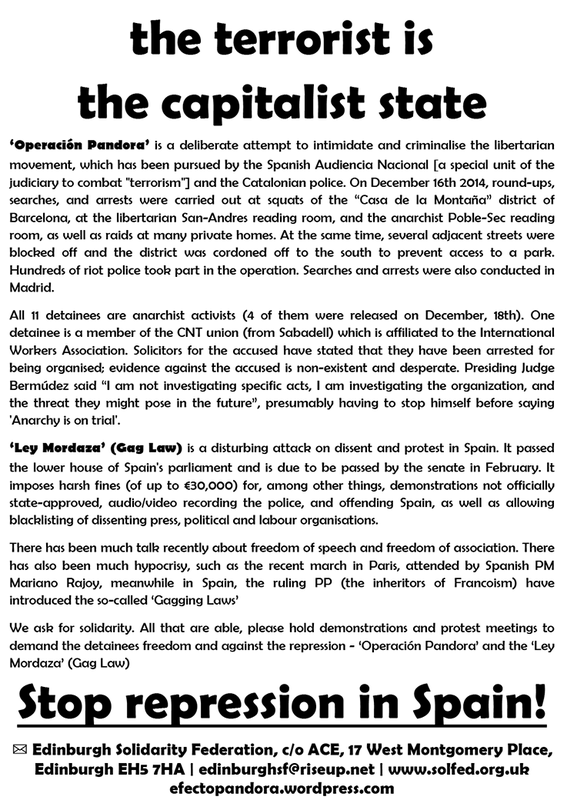 On December 16th 2014, round-ups, searches, and arrests were carried out at squats of the “Casa de la Montaña” district of Barcelona, at the libertarian San-Andres reading room, and the anarchist Poble-Sec reading room, as well as raids at many private homes. At the same time, several adjacent streets were blocked off and the district was cordoned off to the south to prevent access to a park. Hundreds of riot police took part in the operation. Searches and arrests were also conducted in Madrid. All 11 detainees are anarchist activists (4 of them were released on December, 18th). One detainee is a member of the CNT union (from Sabadell) which is affiliated to the International Workers Association. Solicitors for the accused have stated that they have been arrested for being organised; evidence against the accused is non-existent and desperate. Presiding Judge Bermúdez said “I am not investigating specific acts, I am investigating the organization, and the threat they might pose in the future”, presumably having to stop himself before saying 'Anarchy is on trial'. ‘Ley Mordaza’ (Gag Law) is a disturbing attack on dissent and protest in Spain. It passed the lower house of Spain's parliament and is due to be passed by the senate in February. It imposes harsh fines (of up to €30,000) for, among other things, demonstrations not officially state-approved, audio/video recording the police, and offending Spain, as well as allowing blacklisting of dissenting press, political and labour organisations. 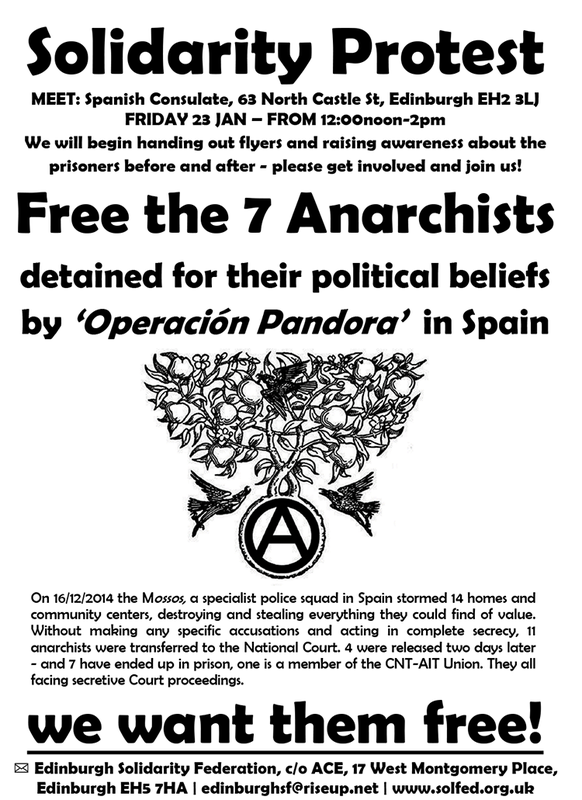 "Edinburgh Anti-Operacion Pandora Picket - On Friday 16th January we held our first protest against the repression and intimidation of anarchists by Operation Pandora in Spain. The demonstration was well attended by protesters from Spain, Edinburgh and Glasgow - from local anarchists and anarcho-syndicalists, as well as other working class and unwaged claimants' organisations, unions and other supporters. We handed out hundreds of flyers to raise awareness, and even had our own Samba band! 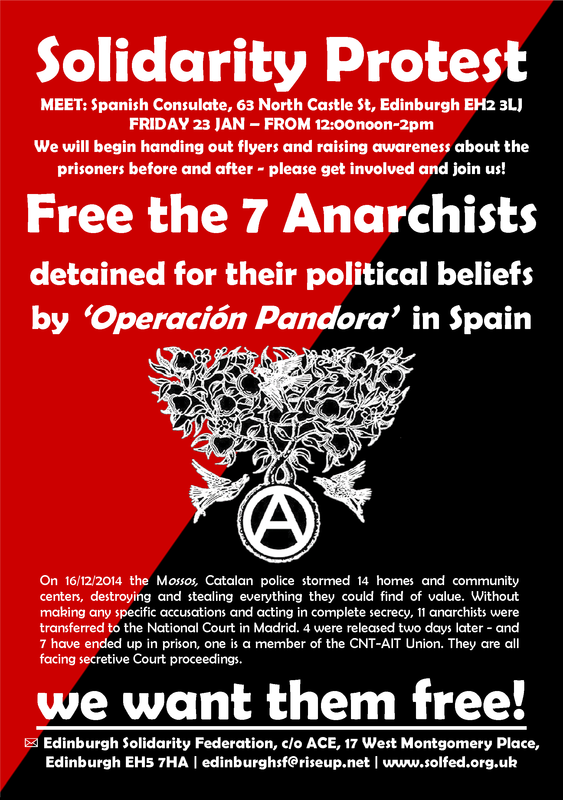 We have decided to continue a visible solidarity, so we will hold our second solidarity protest in one week for the anarchist detainees of Operation Pandora on 23rd January from 12noon-2pm, We will begin handing out flyers and raising awareness about the prisoners before and after - please get involved and join us!"